Newsy spoke with one Venezuelan woman in Caracas about living through a mass exodus of people from the country. 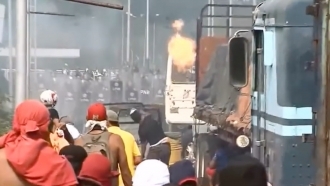 Political repression and dire economic strife are fueling a mass exodus from Venezuela. For the people who stay behind, social isolation can start to set in. Newsy spoke with one resident of Caracas, who prefers not to be identified, about the pressures she faces in her everyday life. About 3.4 million Venezuelans are currently living abroad as refugees and migrants, according to the United Nations. The organization estimates about 5,000 people left the country a day in 2018. By her own estimate, around 70 percent of this woman's family has now fled the country. Technology can help bridge the gap between absent family members, but frequent blackouts in the country have imperiled even that level of connection.